Photo courtesy of WSU Joseph C. Slater, chair of the Department of Mechanical and Materials Engineering helped organized 101 sessions at the American Institute of Aerospace and Astronautics SciTech in San Diego. FAIRBORN — Joseph C. Slater, chair of the Department of Mechanical and Materials Engineering in the Wright State College of Engineering and Computer Science, played one of the top leadership roles at an annual aerospace forum in California that drew scientists and researchers from around the world. Slater served as technical chair of the Aerospace Design and Structures Group of the American Institute of Aerospace and Astronautics SciTech in San Diego on Jan. 7-11. SciTech – the Science and Technology Forum and Exposition – program covers the science, technologies and policies that are shaping the future of aerospace. The forum is the largest event for aerospace research, development and technology in the world, bringing together 11 individual technical disciplines. AIAA SciTech Forum delegates include over 1,000 undergraduate and graduate students and aerospace professionals from nearly 1,000 corporate, academic and government institutions in 42 countries. The Aerospace Design and Structures portion continues the tradition of what would have been the 60th Structural Dynamics, Mechanics and Materials Conference. Plenary and forum participants tackle the most pressing issues impacting the future of aerospace, while the technical program results in the presentation of innovative research and technologies. Slater managed sessions along with the technical chair of Aerospace Systems, Eric Silk, branch head for cryogenics and fluids, NASA Goddard Space Flight Center; and the technical chair of information systems, Stephen Blanchette, director, software systems and acquisition, The Aerospace Corporation. Slater, Silk and Blanchette organized 101 sessions at the five-day forum, during which 479 papers were presented. Overall, SciTech featured more than 500 technical sessions and 2,350 technical papers. The American Institute of Aerospace and Astronautics is a professional society for the field of aerospace engineering, representing more than 30,000 members from 88 countries. From its creation in 1963, AIAA has organized conferences to serve the aerospace profession as part of its mission. Spanning over 70 technical discipline areas, AIAA’s conferences provide scientists, engineers and technologists the opportunity to present and disseminate their work in structured technical paper and poster sessions, learn about new technologies and advances from other presenters, further their professional development and expand their professional networks. In 2012, AIAA incorporated its individual technical conferences as part of five major forums, each focusing on a theme, Science and Technology, Aviation, Space, Defense, and Propulsion and Energy. The forums helped AIAA maintain and strengthen its role as the technical leader while becoming more relevant to a larger segment of the aerospace community. The strategy was designed to serve not only members focused on the traditional aerospace technologies but also those working further up the product chain, in process execution and mission applications as well as integration and systems. It was also designed to increase communication among the different groups involved in the aerospace development chain in order to enhance innovation. 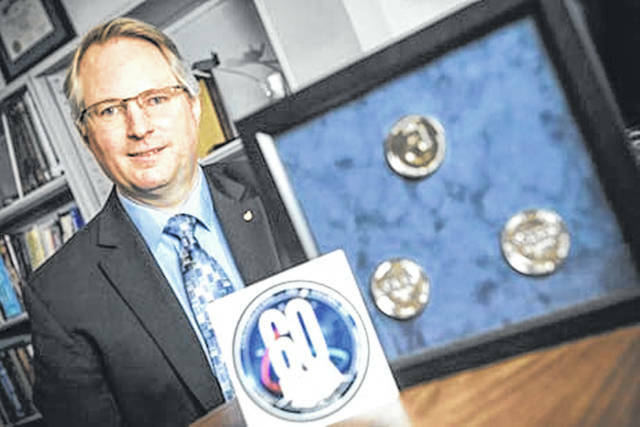 Slater has been a member of AIAA for 33 years and an Associate Fellow since 2001. Only 250 members are selected each year for that honor. For more information on Wright State University visit www.wright.edu. https://www.beavercreeknewscurrent.com/wp-content/uploads/sites/49/2019/02/web1_Slater.jpgPhoto courtesy of WSU Joseph C. Slater, chair of the Department of Mechanical and Materials Engineering helped organized 101 sessions at the American Institute of Aerospace and Astronautics SciTech in San Diego.